RUNSEWE LEADS AFRICANS TO A CREATIVE DESIGN TRAINING IN SHENZHEN, CHINA. The diplomatic relationship between China and Sub-Sahara Africa recently received a significant boost with the Director General of the National Council for Arts and Culture (NCAC), Otunba Olusegun Runsewe leading a 22 man delegation from 8 African countries to a Creative Design Programme in Shenzhen, China. The programme, which was organized by the Bureau of External Cultural Affairs of the Chinese Ministry of Culture and Tourism was aimed at advancing the development of the Creative Design Industry in Africa and fostering greater collaboration between China and Africa. Receiving the Runsewe led African delegation at the opening session on behalf of the Chinese Government, Ms. Yang, Deputy Director – General of Shenzhen Administration of Culture, Sports and Tourism, said that the third African Creative Design Training workshop was intended to strengthen the cooperation between Shenzhen and Africa in Culture and Creative industries. She said that African countries have a lot to learn from Shenzhen which is the first special economic zone to be established in China. She added that since the establishment of Shenzhen in 1979, its cultural industries have grown steadily to become one of the seven pillars of the Chinese economy, with 40,000 enterprises creating more than 900,000 jobs. She called on the delegates from Africa to take advantage of the training to understudy the Chinese culture and Creative Design Industry with a view to enhancing their knowledge and capacity. In his response, Otunba Olusegun Runsewe, the leader of African delegation expressed appreciation to the Chinese Government for availing the delegates the opportunity to learn from the Chinese experience. Runsewe noted that China and Africa have had a strong diplomatic relationship dating back to several decades, adding that the Creative Design training was borne out of the determination of China to work with African countries to advance the course of development of the continent. He called for greater collaboration between China and African countries in the areas of Culture, Tourism, Creative Arts and Design, Science and Technology, among others. On the specific case of Nigeria, Runsewe said that there were a lot of similarities between China and Nigeria in terms of population and cultural diversity, adding that a closer working relationship between China and Nigeria would be highly rewarding to the two countries. The third Creative Design Training for Africa took place in the city of Shenzhen, China, from 6th to 13th May, 2018. Nigeria was one of the ten countries that participated in the programme. Other countries were Angola, Equatorial Guinea, Mozambique, Sao Tome and Principe, South Africa, Sierra Leone, Seychelles. 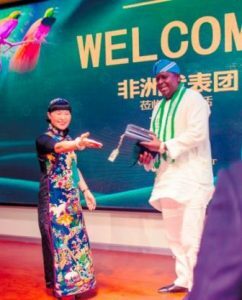 RUNSEWE IN CHINA, DECLARES NIGERIA AS HEART OF AFRICAN CULTURE.